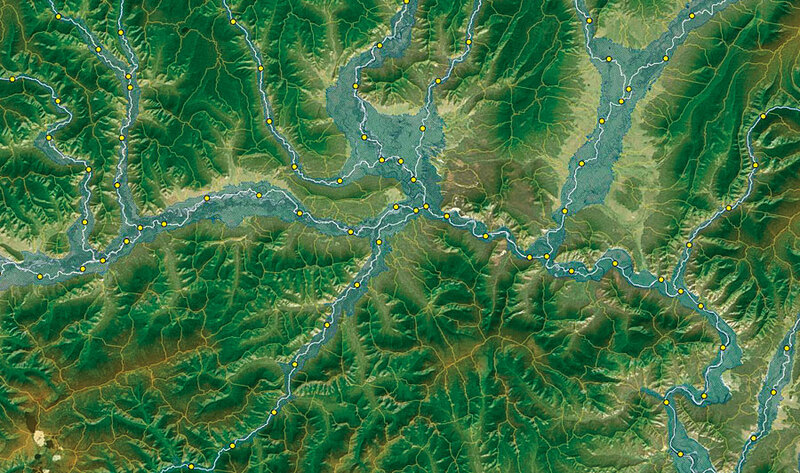 RESonate allows users to analyze multiple data layers at once for river networks that cover thousands of square miles. In the spring of 2016, a group of researchers from the United States and Mongolia loaded into a van and set out to ply the banks of the Bear River, a mountain stream that flows across the borders of Utah, Idaho, and Wyoming. They were hunting for unique hydrologic and geomorphic sites that could establish a context for studying the flora and fauna of the river and its tributaries as part of a larger comparative study of American and Mongolian waterways. The river systems in the two nations could not be more different. In the United States, growing population centers, agriculture, and dams all affect river biota and structural health. Mongolian waterways, on the other hand, have far fewer impoundments and are largely undisturbed, since a sizable portion of the population is nomadic. Despite such a low rate of anthropogenic disturbance, however, Mongolia appears to be experiencing amplified effects of global warming compared to North America. This is why these researchers, along with a handful of graduate students and technicians, are studying rivers in the United States and Mongolia. Examining the differences between the two countries’ river systems may help scientists make predictions about them and the greater effects of climate change. But the Mongolian government is planning to build hydroelectric dams in the coming years, so studies of the country’s rivers need to be carried out quickly—which is why the team is using ArcGIS to rapidly categorize and select research sites from afar without having to visit every river system first. The Macroecological Riverine Synthesis project, or MACRO, is a five-year undertaking in which the group is researching 18 temperate steppe rivers between the two countries to gain a better understanding of how current rapid environmental change might alter natural ecosystem processes. Aided by a $4.2 million grant from the National Science Foundation, the study takes a macrosystem-level look at rivers, examining ecological processes that occur at the large, ecosystem-wide scale. Working within what’s called the Riverine Ecosystem Synthesis (RES) framework, researchers are categorizing rivers in both nations into hydrogeomorphic segments. These segments, known as Functional Process Zones (FPZs), are large patches of aquatic habitat—from less than a mile to sometimes over 60 miles long—nested between watersheds and river reach levels. FPZs of the same type have similar characteristics, such as geologic histories, discharge patterns, sediment regimes, and channel forms. It is thought that geographically separate yet comparable river systems have more in common ecologically than adjacent but dissimilar patches of habitat, so FPZs are an important way to frame large-scale research questions and come up with water management programs. This study, however, is one of the first of its kind. To determine the distribution of FPZs in these two faraway countries and select field sites to study in more detail, the Aquatic Ecology Laboratory of the Kansas Biological Survey (located at the University of Kansas) developed a set of Python-based GIS tools that help researchers characterize riverine landscapes in the lab before beginning fieldwork. When used in conjunction with other modeling procedures, these tools—called RESonate—can assess the character of large river networks quickly and inexpensively. RESonate automatically extracts 11 hydrogeomorphic variables from geospatial data layers and datasets derived from modeling procedures. Currently, all the output variables are provided by four principal data layers: digital elevation models, generalized geology, long-term precipitation, and a floodplain polygon layer. To generate these input layers for RESonate, GIS technicians rely on tools found in the ArcGIS Spatial Analyst and ArcGIS 3D Analyst extensions and the Arc Hydro data model. For example, for rivers in the western United States’ Great Basin (including the Bear, Carson, and Humboldt Rivers), researchers used Spatial Analyst and Arc Hydro to create a synthetic, or custom, river network, as well as the hydrologic inputs—such as flow direction and flow accumulation rasters—for the FLDPLN tool, a 2D cellular flood model that estimates the extent of floodplains in a river system. Researchers also employed a high-flow accumulation threshold in Arc Hydro to generate a valley ridgetop layer, composed of many small micro-watersheds that correspond to high points in the valley topography. They looked at satellite and aerial imagery as well to assess each river segment’s planform (the appearance of the river’s channel), bankfull width (the size of the channel needed to convey heavier amounts of water), and valley sinuosity (curvature). All this helps researchers garner information about a river system and its surroundings. Users can also modify the code that underlies the existing RESonate toolbox. If they want to add variables such as soil and land-cover information, they can employ ArcPy, a Python site package from Esri, to modify existing functions or add new tools that accommodate project needs. Once the layer inputs are ready, the data extraction process begins. A GIS technician selects the first tool in the RESonate toolbox, which creates a file geodatabase and master table in a directory specified by the user. RESonate then generates sample points from the river’s mouth to its most upstream end at user-defined intervals, as well as along each tributary branch in the study area. RESonate then gives each sample point a unique identifier that indicates the name of the river and the point’s distance from the mouth. After RESonate divides each stream network into these uniform sample segments (which provide an adequate representation of the river character in large watersheds), it uses the Surface Spot tool—built using 3D Analyst—to extract precipitation, elevation, slope, and geologic values from the raster and vector layers at each sample point. Throughout the data extraction process, RESonate continually updates the geodatabase and master table with hydrogeomorphic values. 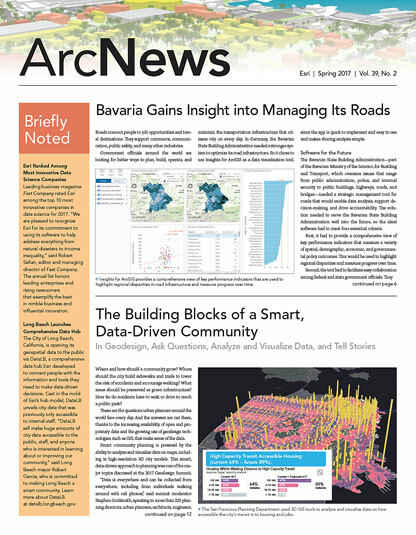 Once the final data table is generated, GIS analysts can load it into statistical software, such as R, and—using hierarchical clustering techniques—group together segments with similar characteristics. Researchers can then categorize these areas into FPZs. MACRO researchers used analyses from RESonate to pick analogous river study sites in the Great Basin and Mongolia. The US sites in the Great Basin were recently sampled—with researchers studying macroinvertebrates, fish, hydrology metrics, and more. Sampling in Mongolia is scheduled to begin this summer. In addition to using RESonate for the MACRO project, developers hope that natural resource managers will be able to employ the tool to pick sites for research and restoration projects among large river systems and for conservation and management needs in smaller river segments. Governments and nonprofit organizations distribute most of the necessary primary data sources (such as climate, elevation, and hydrology datasets) for free, and this would help forge a common knowledge base among GIS analysts, geoscience researchers, ecologists, and environmental scientists, making it easier to communicate hydrologic issues to natural resource managers and policy makers. Developers are also now updating RESonate’s toolbox with additional geoprocessing scripts to help open it up to users with only basic knowledge of GIS. Nicholas Kotlinski is an assistant researcher and GIS technician at the Kansas Biological Survey’s Aquatic Ecology Laboratory. For more information about the MACRO project, email him.